Jerome Rothenberg’s poetic work began in the late fifties. It was after his stay in Europe that his writing took the form of what would become a life-long program. His first published book, New Young German Poets (1959), already showed his characteristic interest in translation, poetics, avant-garde writing, and their relation to the human condition as a deeper presence restructuring the poem. Although his work can be associated with that of his early group—David Antin and Armand Schwerner, among others—Rothenberg’s work is unique. He shares techniques, contexts and a literary/cultural field with others, but his ends are sui generis. In this first period of his work, Rothenberg saw image and emotion (however suspect) as primordial dynamic—and daimonic—forces giving life to the poem and as powers capable of introducing and re-producing a non-visible dimension. The interaction of this visionary aspect of his poetry and his commitment to experimental writing, which came from his international outlook and from aspects of the North-American avant-garde, is the force that gives shape to his poetry as a whole. Rothenberg’s poetics of vision follows the Romantic tradition. Blake was a strong influence from the start. But if we want to understand the newness of Rothenberg’s position we need to take into account that—in contrast with many other American poets of the post-war period—he developed his literary work in wide-ranging communication with other traditions. He took Charles Olson’s interests in ancient cultures in a new direction and energetically researched and translated from other languages and texts. Rothenberg was one of first innovative North-American poets to develop in the context of a contemporary multi-national poetry community across the Americas and Europe. He is both American at core and as post-American as possible in practice. Rothenberg was not the only one interested in Lorca or Neruda, for example, or in early avant-garde and post-war European poetics—though this spectrum was not at all typical in the U.S.—but his approach was very different from previous ones. Where Olson, say, was only interested in ancient Mayas, just one decade later Rothenberg, like Paul Blackburn and Margaret Randall among others, entered into an active relationship with a number of contemporary Latin American writers. And most importantly he decided to construct his own work strongly bolstered by a growing network of transnational contacts. This participation was not simply a matter of a pioneering effort to reach out and establish bridges between writers from different national literatures and languages but was also an element that triggered and permanently altered his literary practice. This international context may well be one of the factors involved in the somewhat marginal position he was given in the “New American Poetry” that was then emerging. Rothenberg was not just one more important “American” poet appearing to readers in the sixties. He was a pioneer Pan-American writer, with a profile different then from those of the Beats and other counterpoetics movements and still separate today from those of the mainstream poetry and post-language-poetry scenes. But again, this emergent global aspect did not appear by itself but in tandem with Rothenberg’s belief—explicit at the beginning of his career and implicit later in an almost semi-secretive way— in an underground reality for which poetry is a door or window. And this is where his “deep image” poetics takes on full meaning, as is best seen in the small but very significant collection of poetics, translations and collaborations in his Poems from the Floating World (1959-1963), both a mini-magazine and a cross-cultural anthology, that was, in Foucault’s term, a heterotopia. Although it may not be obvious, Rothenberg’s first poetry collection White Sun Black Sun (1960) was born out of this same interaction between an older visionary paradigm and a new post-Western and radically innovative approach to writing. White Sun Black Sun’s title, for me at least, reflects the encounter of Western (“white”) critical poetics and other cultures and dimensions (“black”). This combination of a powerful and conscious technical interest and an underworld vision quest, results in a verbal structure increasingly ruled by parataxis, collage, disjunction, assemblage, juxtaposition, enantiodromia, but also an enterprise based on egalitarianism, collective creation, and an ongoing search for new centers. With the expansion of the experimental, international and historical aspects of his poetics, some of the early Romantic elements lost their centrality. Emotion gave way to a full exchange between vision and experiment, in which the logic of entangled sightings (entries into the other world through poetic percepts) and “deep image” as such disappeared from Rothenberg’s main vocabulary, making his poetics go from a search for a mystic source out-of-and-into darkness to a decentered poem and (perhaps more importantly) a decentered subject. 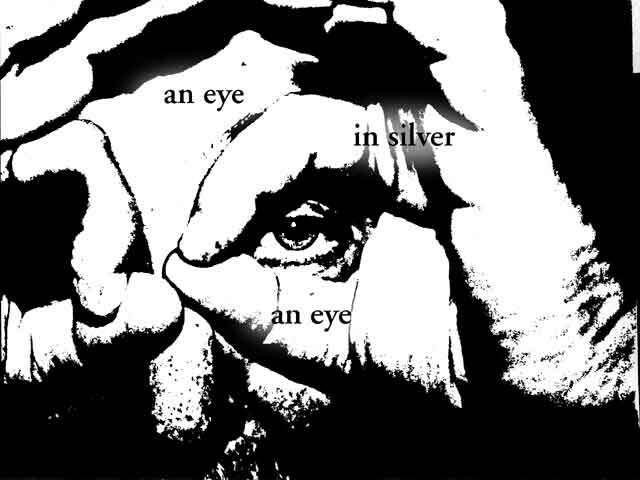 Rothenberg suppressed his original visionary “I” only to engage in a range of experiments with multiple “I’s” and eyes. One can see the gradual change from a Romantic American Deep Image to a post-Romantic plural vision in the transition from Between 1960-1963 to The Gorky Poems (an edition which by the way involved binational and bilingual work). Although Rothenberg himself seemed to have completely abandoned “deep image” and even came to see his work there in a self-critical way, there is certainly a continuity between the understanding of this earlier period and the new period in the making. A new dimension in Rothenberg’s work began in the second half of the sixties. The key concept now was ethnopoetics—a continuation, among other things, of Olson’s travels into Mexico, of Pound’s explorations in global collage, of his own readings of anthropological sources, and with that too he brought a logical conclusion to the project of European avantgardists like Tristan Tzara (and the European avant-garde in general), to bring to light a heterogeneous range of poetries from other geographies and with an opening as well to other, often occluded levels of consciousness. In Rothenberg’s case, there was also a systematic impulse to build a new image of poetry worldwide and to subvert Western poetic understandings using materials from other strains and cultures. One can easily bypass the heart of Rothenberg’s poetics—especially once ethnopoetics appears and attracts attention—not only because Rothenberg does not openly insist on the metaphysical nature of his poetics (he is in fact skeptical about it) but also because so much contemporary experimentalism (at least in its post-sixties phase) has a strong connection to positivistic, post-modernist and anti-metaphysical tendencies (from analytical philosophy to deconstruction), according to which language is a cultural surface or network, with a consequent lack of any real sense of depth. As time passed, Rothenberg’s work came to be understood in the context, for example, of Language Poetry, most of whose poets (but not all) define their poetics in opposition to any metaphysical or religious claims. But Rothenberg’s poetics does contain metaphysical premises: ethnopoetics is not only a poetics of multiculturalism and a post-colonial mapping but also a search for a primal poetics, an investigation into the relation of the non-conscious mind and its cultural forms of expression. Rothenberg has been very careful in establishing parallelisms between shamanism and contemporary poetry and art. He doesn’t want to draw premature conclusions, but putting the relation of shaman and poet into discussion was a frontal part of his ethnopoetics project—though he later preferred the trickster figure as a closer model for comparison, probably because of the more ambivalent and absurdist nature of the trickster’s cultural function. His assemblage Technicians of the Sacred (1968) opened our historical consciousness to the range of poetries across the globe and shattered for some of us the basic Eurocentric beliefs that still dominate the literary domain, “a concerted assault,” as Charles Bernstein described it, “on the primacy of Western high culture and an active attempt to find in other, nonwestern/nonoriental cultures, what seemed missing from our own.” And yet it was at the same time a more than 500-page-long manifesto on the skills and epistemic possibilities of ritual/performance and of oral and visual image-making, wherever found. Ethnopoetics thus seen is at least triadic: experimentalist in literature, multicultural in politics and esoteric in religion. To read his poetry fully, we need to understand that the changes his work has gone through do not follow a linear order in which prior discoveries or principles get pushed aside for newer ones. Rothenberg’s work is braid-like. Poland/1931 (published in 1974, but in preparation since the late sixties) is an experiment in an altered ethnopoetics, a turn from the early primitive, archaic and indigenous explorations (first in Technicians and then in Shaking the Pumpkin) to a playful investigation of his own immigrant and Jewish imaginaries. At this point in his work, Rothenberg is using different voices to recall fragmentary memories that re/dis/cover image and sound legacies coming from disparate (and desperate) archival and phantasmagoric sources. His ethnopoetic assemblage projects continued in the seventies with magazines like Alcheringa and New Wilderness Letter and the anthologies America A Prophecy and A Big Jewish Book. 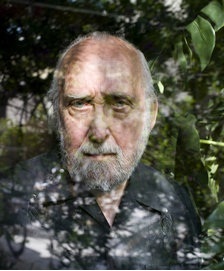 At this point in his career, Rothenberg was centrally linked with “ethnopoetics” though I think few thoroughly understood that ethnopoetics as a form of poesis is a collage including cryptohistory — a call for the simultaneous renewal of cultural forms and a reconfiguration of consciousness, a matter of making new cultural and spiritual constellations available. And it is at this level that ethnopoetics — as the creative research on how culture produces poiesis — involves an ethopoetics — how poiesis in turn produces communities and subjectivities (ethos). Each of Rothenberg’s successive books of poetry can then be read as an increment in voices and memories, a present that never stops uncovering new pasts. From A Seneca Journal (1978) to That Dada Strain (1983), Rothenberg saw a new transition coming (and again marked it with a retrospective gathering of his work, New Selected Poems ). It is at this ethopoetic level, that Rothenberg’s can be read not as a project mainly occupied with exterior entities — other traditions, composition techniques, etcetera — but as that of a poet undergoing a process of metamorphosis through different phases. The movement from Deep Image to Ethnopoetics was part of an ethopoetic desire to construct a post-Romantic — but still visionary — poetry. During the ethnopoetic stage, Rothenberg made adjustments — which again let us see more clearly the ethopoetical aspect of his becoming — going from an ethnopoetics centered on the other(s) to an ethnopoetics centered in his own Jewish-Western imaginary. Accordingly the new 1985 edition of Technicians of the Sacred included European materials, and in the nineties Rothenberg’s translation work would concentrate on avant-garde figures like Lorca, Schwitters, Nezval, and Picasso, and his new big project in the 1990s would be a global reordering of modern and post-modern poetries in the first two volumes of Poems for the Millennium (with Pierre Joris). But none of this can be fully understood only at the level of books and texts. Performance is a crucial part of Rothenberg’s poiesis. As in other cultural contexts, in his work as a poet the strengthening of performance can be seen as a sign of the birth of new forms. Performance is not “form” — a closed or at least recognizable form — but an unsettled form-process, a form-in-becoming or even a form-that-will-not-accomplish-itself—a kind of ephemeral or liminal transition between one form and another in which culture goes through a crisis to transform and make sense and non-sense during the struggle, an interplay of resistance and emergence. This is why performance is so important in Rothenberg’s poetry, and one can see that many of his transformational peaks are located precisely around those series of poems that most clearly involve performance: the Navajo and Seneca “total translations” (chants), for example, and the poems dedicated to the older Dada poets. These high performance works from the 1970s and 1980s announce a change in Rothenberg’s poetic subjects and his (conscious and unconscious) writing methodologies. If performance is how we go from one form to another, without the need or help of rational means — and with body as a catalyst — it is not the individual poet who performs but who himself becomes the subject of performance. Performance occurs when the body enters into a strong field of non-standard language. The eye of performance is the eye of the hurricane: the central ego disappears and is replaced by the void produced by the intense movements of energetic language around it. Performance is also used by Rothenberg to make texts come into living material conditions — a fulfillment of the verbo-voco-visual-soma. With Rothenberg, performance gives full life to poems through the revival of voices coming, he seems to tell us, from the elsewhere — as the performer’s body and identify are altered by the very action of performance. In a related sense Rothenberg’s use of the word “Pre-Face” is yet another turn of phrase that signals ethopoetical transformations. The word itself became idiosyncratic in Rothenberg’s work starting with the now classic pre-face to Technicians of the Sacred (which also included a post-face). Pre-Face here implies a change of identity, and it is no accident that Rothenberg’s prose frequently takes the form of prefaces or postfaces. His poetry collections use them further as a kind of explanation or commentary on the circumstances, procedures, intentions and ideas behind the writing. The presence of these pre/post-faces is an unequivocal key to understanding the whole of Rothenberg’s work, poems and poetics alike, as a series of experiments in trans-forming the poetic subject and per-forming the language inside of which the poet becomes an-other. Through these pre-faces — as in his other essays and even in his commentaries—Rothenberg became one of the most persistent practitioners of “poetics” as a literary, even a poetic genre of its own. Probably no other North-American post-war poetic movement — with the clear exception of various feminist tendencies — had the potential to become a field of study in its own right as did ethnopoetics. Ethnopoetics as a proto-social-science opened a hybrid discourse that freely merged poetry and anthropology, and in a more subterranean way implied something like a psychohistory, that is, a discourse on the manifestation of forms and contents belonging to the dead in the embodied consciousness of the living individual, a pairing that was best captured in the poems and title of Poland/1931 — where “Poland” can be read as a sign of past, of the dead and others, and “1931” (Rothenberg’s birth year) as a sign of the personal: a collaboration between a ghostly otherness and a private body by means of an unconventional language that blends the communication between the two sides of the equation. Vision and perception mediated by a gatekeeper who refuses to simply translate. The dead are the portal into our own identities, the undercurrent of memory, of the past flashing into our current imagination, self, and senses. We lack the proper skills to understand the activity, “the presence of the dead,” as Rothenberg once put it, in our daily lives. The individual is not a single entity, but an indivisible congeries of others. In the search to better understand this, some form of art and poetry may serve us as a kind of speculative speech, a playful and uncanny set of representations on the impossibility of a language exclusively created by a single entity. Rothenberg’s persona (that is, the mask through which all speech emerges) grew in voices, sources, archives, traditions, techniques, forms, audiences, both on the page and in performance. Then, after That Dada Strain, his poetry took yet another turn. Rothenberg’s first poetry period had occupied itself with the descent into darkness, a vision that he kept exploring: the abyss, wilderness, hells, flower-worlds, paradises, mystical dimensions, and all sorts of underworld characters and scenes, using a complex collection of avant-garde and post-romantic methodologies to call them out. His journeys into new regions have continued from the eighties into the present century through his masterful explorations of new times and places: from the death camps of Khurbn (1989) to the openings and furtive glimpses of Gematria Complete (2009); from his scattered poems derived from travels into old geographies and cultures to the surge of fresh translations in A Paradise of Poets (1999) and the darkened worlds and rooms embedded in Concealments and Caprichos (2010). These multiple landscapes are “cruel nirvanas,” imaginal space-times of suffering. As such they call us to become many, an other or a series of others, of voices coming from all roles, levels and directions. Poet-as-witness is post-shamanic. It is no accident that this figure-function gains importance after That Dada Strain, whose last poem (in the book of that title) is dedicated to the rise and fall of María Sabina, the Mazatec shamaness, a kind of rite of passage to separate from the shamanic dream she symbolized. Rothenberg knows that late poets cannot be shamans. (There’s no visible tribe, pure Myth does not exist in a world after Hollywood, nor can the shaman holistically heal because he or she is historically wounded.) But Rothenberg refuses to accept that a poet is just a plain writer and that language is merely cultural. The I and spirit that a certain post-modernism dismissed reappears in the mud. Psyche is undeniable. Language is vertiginous. Poetry is soul-re-making — if only by chance. 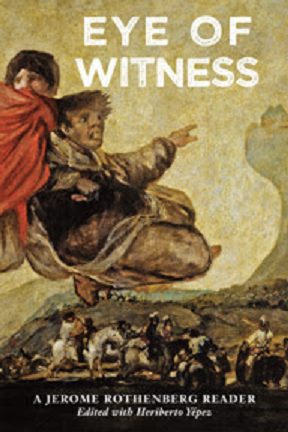 Poet-as-witness is still in the making, and it may well be Rothenberg’s main contribution to poetics, though a more subtle one than ethnopoetics as an open field and Deep Ethnopoetics as a project still to be understood in its complete scope. Probably we will have to become “post-post-modern” (G. Oppen) to understand the importance of Rothenberg’s version of the “witness”, a mode in which poetry is neither neo-shamanism nor pure artifice, neither Romantic nor Post-Romantic. The witness, besides, throws light on the previous stages of Rothenberg’s poetic past, showing the nature of his own experiments with North-American experimentalism, an experimentalism in which discontinuity is not just an aesthetic technique but also a way to call up the presence of death, and parataxis a way to aesthetically render the superimposition of this and the other world. Rothenberg’s witness is the marker of a new kind of poet — its pre-face —in which two apparently opposite drives coexist: an acknowledgement of poetry as a perpetual and radical change of form — and thus the willingness to not retain any-thing — and a desire to construct a total poetics, or — to use a recent word of Rothenberg’s — an omnipoetics: to say in every form possible what cannot possibly be said.